While Southern California is paying residents to peel away millions of square feet of grass to alleviate pressure on water, lawn is still this highly tarmacked region’s single most ubiquitous mitigator of urban heat. Going forward, turf will not be the all-purpose groundcover that it once was but, for now, it has a significant place in the landscape. The ability to manage it judiciously is vital during transition to drier planting schemes. Once summer is over, we can have a serious look at drought to lerant alternatives. In the interim, many people want a lawn which is completely free of weeds, including dandelions. Before you use herbicides, however, remember that dandelions are harmless, pretty can be beneficial to your yard and even your health. Also, be aware that there are less hazardous ways to kill and remove weeds. Here you can read about how to create a healthy lawn and techniques for removing and controlling dandelions. Dandelions can be beneficial to a garden ecosystem as well as to human health. Dandelions attract beneficial ladybugs and provide early spring pollen for their food. In a study done at the University of Wisconsin, experimental plots with dandelions had more ladybugs than dandelion-free plots, and fewer pest aphids, a favorite food of the ladybugs. Dandelions’ long roots aerate the soil and enable the plant to accumulate minerals which are added to the soil when the plant dies. Not only are dandelions good for your soil, they are good for your health. According to the U.S. Department of Agriculture, a serving of uncooked dandelion leaves contains 280 percent of an adult’s daily requirement of beta carotene as well as more than half the requirement of vitamin C. Dandelions are also rich in vitamin A. Dandelions are also used as herbal remedies. The white sap from the stem and root is used as a topical remedy for warts. 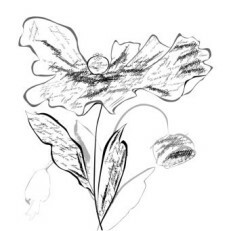 The whole plant is used as a diuretic and liver stimulant. The dandelion is one of the most common and recognizable weeds. The official name for the dandelion is Taraxacum officinale, which means “official remedy for disorders”. There are many common names for dandelions, including priest’s crown, Irish daisy, monk’s head, telltime, blowball, and lion’s tooth. The dandelion is a broadleaf weed, with a deep, fleshy tap root. What looks like a dandelion flower is actually many tiny yellow flowers surrounded by leafy bracts.8 They are produced on stalks 6 to 40 centimeters tall (2.5 to 16 inches) clustered at the base of the plant. The common dandelion is a biennial or perennial plant which reproduces by seed. The seeds spread with the help of their downy parachutes. People often confuse the common dandelion with the false dandelion, Hypochoeris radicata. The false dandelion looks similar to the common dandelion and can be controlled with the same methods. The best defense against dandelions is a healthy lawn, since “a properly maintained lawn is less susceptible to weeds, insects, and diseases. Steps to a healthy lawn include overseeding with the grasses you want to crowd out weed seedlings. Let the grass grow. If you must mow, set your lawnmower to the highest setting to allow the grass to develop a deep root to help your lawn use water better. Mowing at shorter heights allows more dandelion seeds to germinate and makes the lawn prone to weed invasions. Don’t cut off more than 1/3 of the height of your lawn at a time, especially just before a dry summer, as this could cause the grass to go into shock. Leaving the grass clippings on the lawn as fertilizer helps recycle the plant nutrients back into the soil and retain moisture. Avoid over watering; watering deeply and infrequently will build deeper roots and help prevent disease. If you’ve irrigated properly, the water is where you need it — in the roots and the soil — where it will push up lush new foliage as soon as the worst of summer passes. A light green or tawny lawn is perfectly normal when it’s hot and dry. Especially at the height of summer heat instead of pursuing phony-looking spring green turf by watering the legal three times a week for eight minutes each cycle, water only one day a week or every two weeks, or even once a month. Brown lawns aren’t dead. They’re dormant. This dormancy isn’t a scourge, but a terrific tool for hunkering through drought. Decide how many dandelions are tolerable in your lawn, then pull them as necessary. Get as much of the root as possible. Pulling or digging is easiest and most effective when the soil is wet. Dandelions are most successfully pulled when they are small seedlings, before they have developed tenacious tap roots. There are a variety of different pulling tools that make effective dandelion removal easier. Cutting the weeds with longhandled shears is another method, though it will take more than one time to kill the weed entirely. When cutting, cut lower than the lawn mower and make sure to cut all the leaves and as much of the stem as possible. Repeatedly cutting the greens prevents the plant from getting the nutrients it needs to survive. The root will stop sending up new growth and the plant will eventually die. A product that uses radiant heat to kill dandelions is the Puzzy Boy. One model (the Puzzy Boy Punto) is designed to kill weeds with long tap roots. The Punto has two thermal elements, one to kill the parts of the plant above the ground, and a spike on the end to kill the roots. Both are heated by a propane burner. Its retail cost is less than $200. Waipuna, Inc. makes a small hot water weeder called the Green Weeder. It is not currently available in the U.S., but sales are scheduled to begin late in 2001. This weeder uses tap water heated by electricity to kill weeds and allows you to treat weeds without bending over. Like the Punto, its retail cost is under $200. If you have lots of dandelions in cracks in sidewalks, brick patios, or driveways, you might want to try a flame weeder. Flame weeders are also effective on graveled areas. These tools burn propane from refillable tanks that are carried on a backpack. Hold the flame about 6 inches above the weed for a few seconds. The flame heats the dandelion’s sap and bursts the cell walls. Wilting and death occur several hours later. There are several least toxic herbicides available. Corn gluten meal is a pre-emergent weed control product.When applied to turf, it prevents dandelion seeds from sprouting but won’t harm plants that are already growing. Vinegar effectively kills dandelions. Spray it directly onto weed for about three seconds. Be careful though, as vinegar will also kill grass. Remember that dandelions can be beneficial. 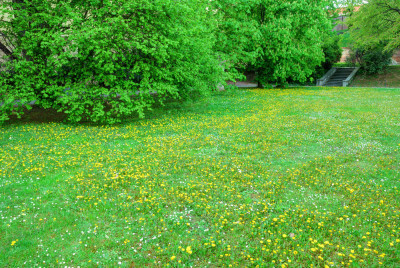 Common lawn weeds such a dandelions are harmless, even edible and certainly pretty. Once mowed, these mixes still add up to a lawn. Be willing to put up with a few dandelions in your yard. If you need to control dandelions, focus on creating a strong, healthy lawn. By maintaining a healthy lawn, you will eliminate the need for other time consuming controls. If necessary, there are many nonchemical tools available to kill dandelions or remove them from your lawn. Please return for the next installment on Pesticide Reform.